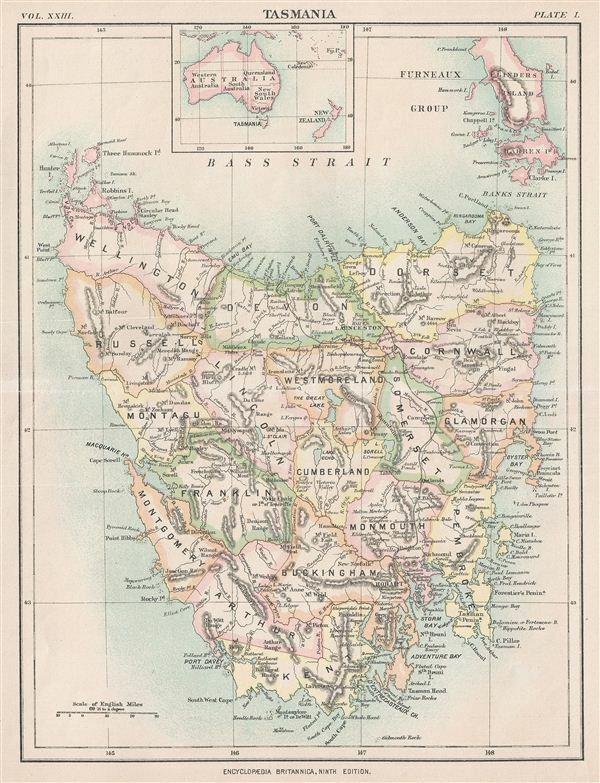 This is a fine example of the 1888 encyclopedia Britannica map of Tasmania. It covers the entire island from Three Hummock Island to South Cape and includes the Furneauz Group of Islands. An inset map near the top margin features Australia. The map is color coded according to regions and provinces with relief shown by hachure. It features various rivers, islands, capes, railroads, and several other topographical features. This map was published for the ninth edition of encyclopedia Britannica, volume XXIII as plate no I.
Encyclopedia Britannica, Ninth Edition, 1888.